I got myself another Wenger knife. Oops, I meant Swiza knife. It is one more C04 khaki. I really like this tool configuration very much and the special handle camo design. Swiza is a company that has developed quickly on the market. I am bit surprised how fast everything has gone. The brand itself is a very old one. The knives like this model are new. It is exciting and interesting to say it lightly to follow. These knives are typical EDC knives that can do a lot of tasks. Versatile knives fit extra well in the modern world and I appreciate technology. EDC are today one of the most important knife areas in my opinion because they find use every day. In my articles about these knives you can hopefully find interesting read and positive impressions. It is really a positive and fresh knife construction. 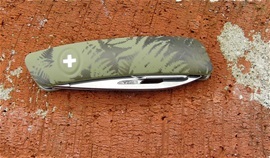 This one I will use for some time for EDC rotation with Victorinox and former Wenger SAKs.